Since I moved to Oregon 25 years ago, I've made many trips to Central Oregon. Not that many in the early years, but more than a few in, say, the last 10 or so years. These trips aren't normally about beer, though I've made it a point to lean on the beer aspect more heavily in recent times. Last week's trip was mainly a ski vacation. We loaded up the new Crosstrek with gear, provisions and the two Labs and headed for the Sunriver condo we've stayed in countless times. I sandwiched a day of beer chasing between days of skiing on Mt. Bachelor. It's easier on the body that way. 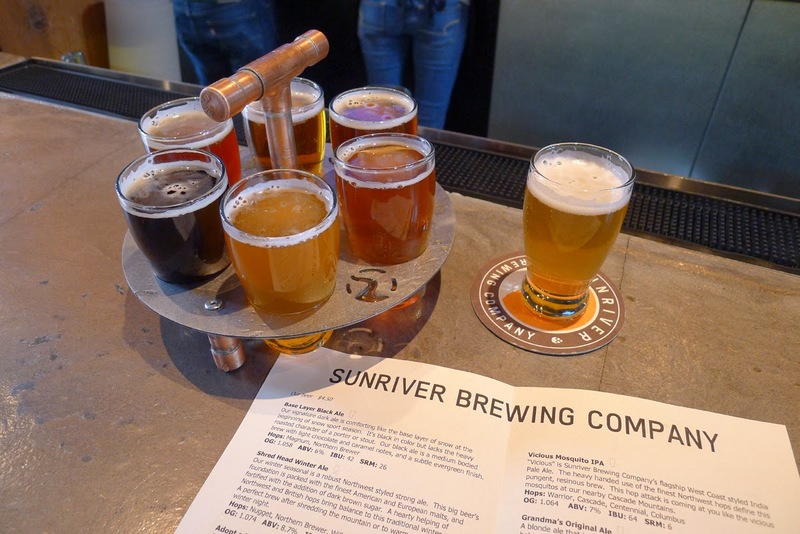 My first stop was Sunriver Brewing, conveniently located in Sunriver Village. Perfect spot for a tourist trap. I originally visited this place shortly after it opened in 2012. At that point in time, their beer was being brewed in Redmond. It wasn't bad, but not very memorable, either. There is no space to install a brewery inside the pub, so I wondered what they would do. Honestly, I figured these guys for another Sunriver joke...and I've seen plenty of those over the years. How wrong I was. These guys now have their own production brewery in Sunriver and they were pouring seven of their own beers in the pub. There are reportedly more on the way. That wouldn't count for much except these are nicely executed beers right down the line. They also had several decent guest taps to round out the list. Beer choices? Lazy River Lager (5.5%ABV, 31 IBU) might not be your first pick on an unsettled March day, but it's a terrific beer. I also liked Adopt a Trail Pale Ale (5.7% ABV, 35 IBU), which is buzzing with the citrus aromas and flavors you normally find in an IPA, only in a more compact package. Granda's Original Blonde Ale (4.8% ABV, 19 IBU) is another fine effort and a perfect session beer. This joint is hardly a secret. 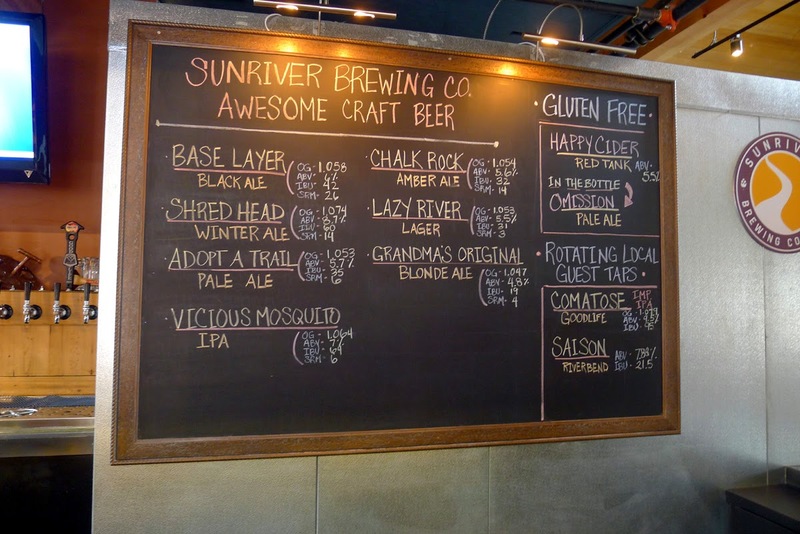 Travelers and I suspect a few locals have discovered Sunriver Brewing. They've got some TVs for sports fanatics and kids are welcome. Besides the beers, they have a solid pub menu at reasonable prices. Pints are $4.50, $3.50 during happy hour (3:00-5:30 Monday-Friday). A bacon cheeseburger will set you back $11.50 and there are other selections in that range. They fill growlers, too, though you will likely find lower prices down the road at the Mountain Jug. 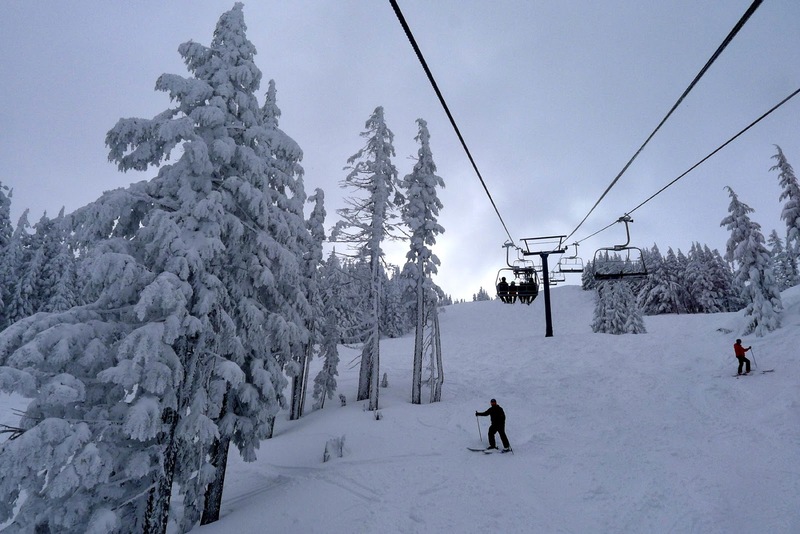 For a long time, Sunriver was a joke from a beer and pub perspective. You had to drive in to Bend for satisfaction. But Sunriver Brewing changes the game. In a place where so many pathetic businesses have failed, these guys are hitting home runs. They're doing it with great beers, good food and attentive service. The pub was a virtual beehive of activity during an afternoon visit. Yet the wait staff kept up and the barkeeps were pleasant and conversational. 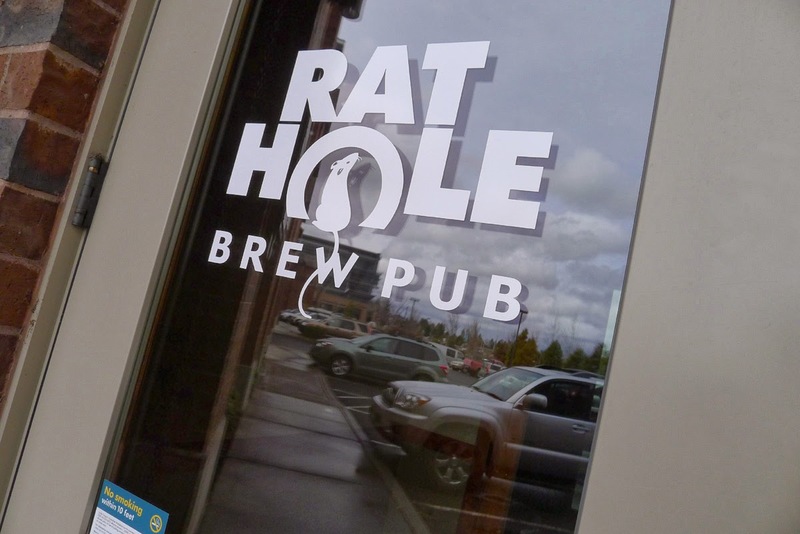 Perhaps the name is related to the fact that Rat Hole's brewery is located in a barn in southeast Bend. That's where Rat Hole began as a family project. Brewer Al Toepfer was an experienced home brewer who earned many awards prior to becoming a commercial brewer. It shows. The pub is located in the Phoenix West building, which appears to be a in a sort of business park. It seemed an odd location, until I discovered the building has housed a string of eateries and a brewery dating back to 2007. The space occupied by Rat Hole is small, even if you include an outside patio, but apparently sufficient for now. The place opened in July 2013. There were 10 beers listed on the Rat Hole board. Several of the beers were blown, including Haystack Hazelnut Brown Ale, a popular favorite. Of the beers on my tasting platter, the Lemon Wheat (5.3% ABV, 50 IBU and served with a lemon slice) was brilliantly refreshing. Rat Hole Saison (5.4% ABV, 62 IBU), made with Red Wheat and Cascade hops is pleasantly likable. 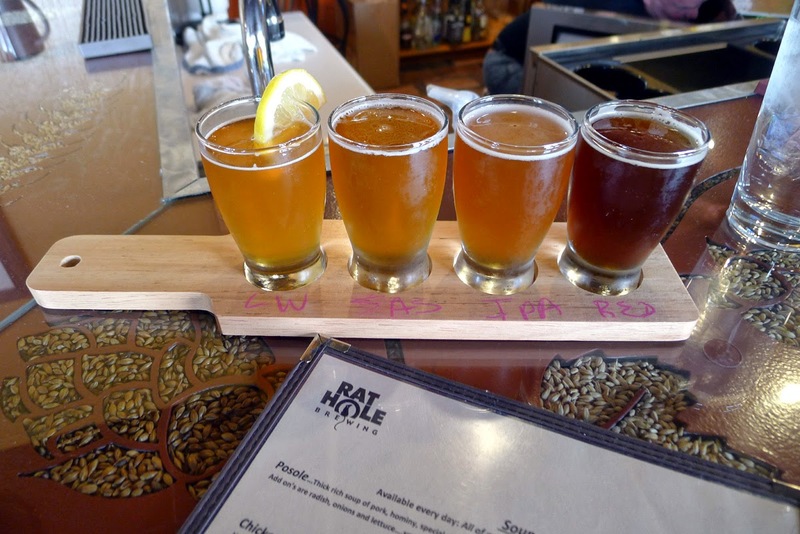 Rat Hole Rye IPA (6.0% ABV, 71 IBU) is mildly spicy with a citrus kick. The Rotation Red Ale (5.9% ABV, 34 IBU) seemed a little lifeless. The Vanilla Porter (5.5% ABV, 30 IBU), features pervasive vanilla aromas, a soft mouthfeel and a nice chocolate finish. It's worth mentioning that Rat Hole's food menu is not typical. The cuisine has a Southwestern flavor... tacos, burritos, nachos and such. They also have a token burger and some sandwiches. The burger will set you back $12. I had a set of three fish tacos for $9. Good value, I thought. Some may consider the food here slightly upscale for a pub. Mostly it's just a different, I think. Rat Hole Brewpub is a worthy stop, for sure. The beers here are well-made and it's an interesting spot. They evidently offer live music several evenings a week and I bet things get a little crazy when warmer weather allows full use of the outdoor space. The gent behind the bar was a former school principal and family member. He could use a little polish, though not bad. 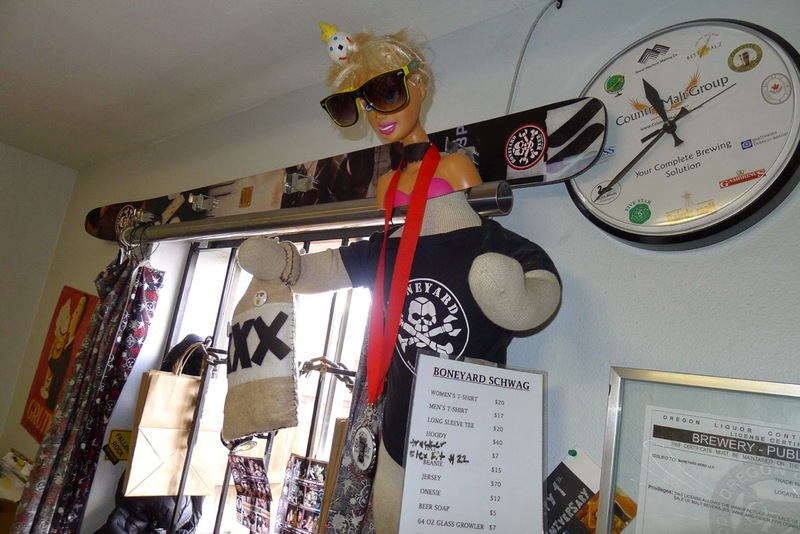 I first visited Boneyard's brewery in Bend several years ago. Things were different then. Boneyard was in high growth mode, but the place was still pretty quaint and charming. The tasting room was home to a pleasant buzz. The heavy metal motif was along for the wild ride. Things have shifted dramatically for Boneyard in the couple of years since. 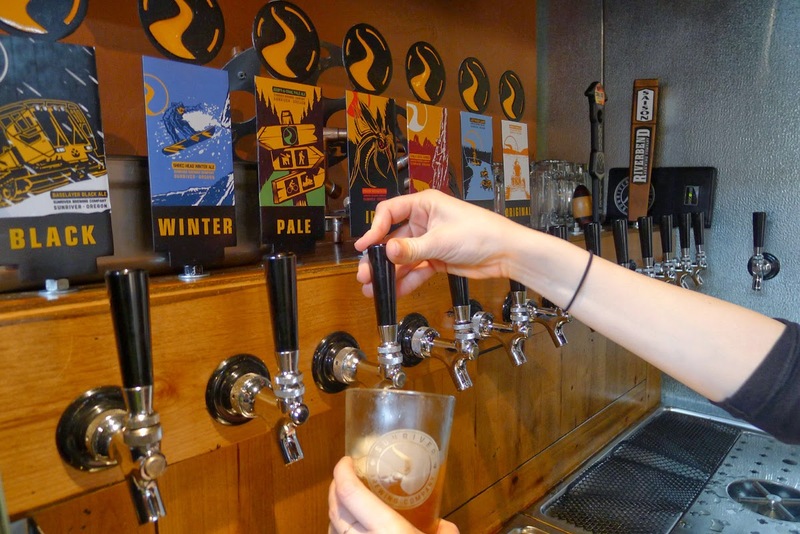 Their product is in such demand that they're ranked among the top ten Oregon brewers by production volume while selling draft only. Plans to can the popular RPM IPA never materialized. Boneyard didn't have to bother. It hasn't been able to keep up with demand from draft accounts. A nice problem to have. There's an expanded brewing facility in the works. Production is still in full swing at the brewery on Lake Pl. But the friendly old charm of the tasting room is gone. Well, if it's there, I didn't feel it. The tasting list was pedestrian and the service was crusty. If I didn't know better, I'd guess the success has gone to a few heads. Not really a surprise. There's more. I've long regarded RPM as a fantastic beer. I knew from a 2011 conversation with Tony Lawrence that he intended to dial RPM down. It's now down to 6.6% ABV (early versions were 7.5%). I had several pints on this trip and it seems to me the current beer doesn't look, smell or taste like the original. Not terrible, but decidedly different. Look, you can't argue with the success Lawrence and Co. have had. They knew what they were doing from day one and they've built a rabid following. The good times will almost certainly continue. But some of the old charm appears to be gone, lost in a tsunami of demand for their beer and the pains that come with that reality. I understand it. I don't like it. Does Low Pay Help Drive Craft Brewery Growth? © 2011-2019 BeervanaBuzz. All Rights Reserved.. Powered by Blogger.